Insures a "New Level" of clean. PLEASE NOTE: Only the Detonator component of BLAST can be added to your cart from this screen... If you want to purchase both Dynamite and Detonator together please Click Here. 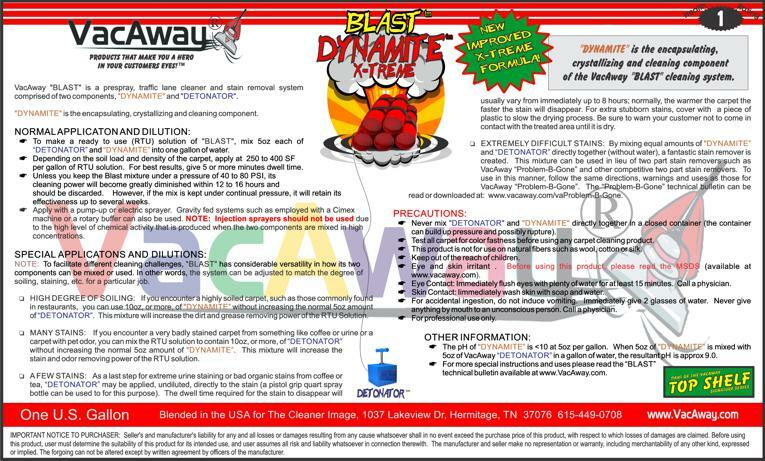 VacAway "BLAST" is a super high performance prespray, traffic lane cleaner and stain removal system. It is comprised of two components, "DYNAMITE X-treme" which is the encapsulating, crystallizing and cleaning component, and "DETONATOR" which is the boosting, activating and stain removing component. This combination makes an oxidizing cleaning system that delivers outstanding cleaning results, remarkable stain removal and odor control that is simply not possible in a one component product. “BLAST” is especially effective at removing organic staining and petroleum based soiling (Excellent for Restaurants). See technical bulletin, MSDS and label for more information. From Champion CCSS of 18661, Pennsylvania on 3/16/2017 . Used Detonator as a booster crystalizer on top of GreaseHawg in a restaurant that was so bad they were going to throw away the carpet. Made the carpet look amazing. From eli shneav of houston, Texas on 12/17/2016 . From Anonymous of Springfield, Missouri on 3/16/2016 . Ive been using this as a pre treatment for automotive stains. I'm probably unorthodox with my use, but also mix with grease hog as a stain booster. Works great on difficult upholstery with water rings and stains. I generally do not extract upholstery. Works incredibly well. From Sarah Miles of Grand Haven, Michigan on 8/12/2015 . Secret Weapon for the rat nasty stinky jobs. Really cuts my labor on extreme nasties. We will never go without it, it's made a big impact on our productivity.